The appointment form in myPASS is the best method to tell us your goals and what areas you are struggling with in your writing. Be as specific as possible to get targeted help within the 30-minute timeframe. This document contains excerpts of undergraduate papers with sample feedback from the Writing Center. Please click on the file to view. This document contains excerpts of graduate-student papers with sample feedback from the Writing Center. Please click on the file to view. 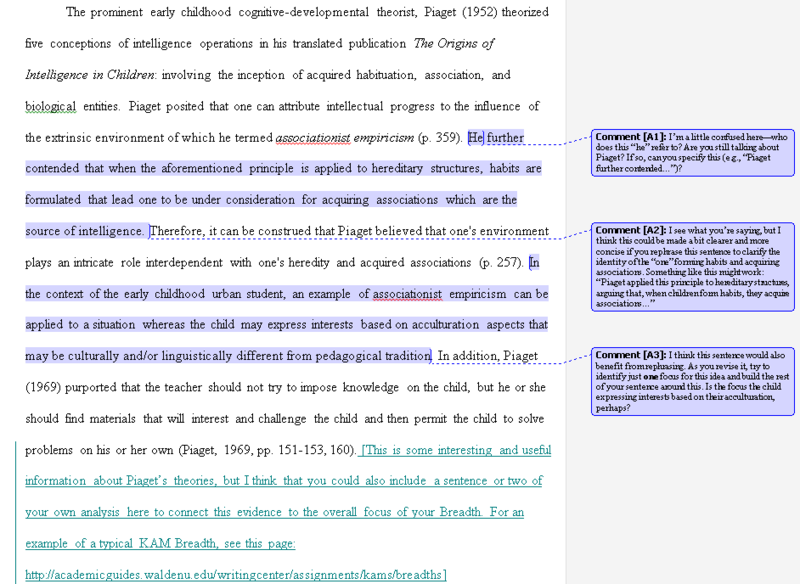 This document contains an excerpt of a discussion post with sample feedback from the Writing Center. Please click on the file to view. This document contains an excerpt of a student's revised draft with sample feedback from the Writing Center. Please click on the file to view. This document contains an excerpt of a student's graded paper with sample feedback from the Writing Center. Please click on the file to view. This document contains an excerpt of a student's KAM with sample feedback from the Writing Center. Please click on the file to view. This document contains an excerpt of a student's reference list with sample feedback from the Writing Center. Please click on the file to view. This document contains an excerpt of a student's major assessment with sample feedback from the Writing Center. Please click on the file to view. This document contains an excerpt of a student's master's thesis with sample feedback from the Writing Center. Please click on the file to view.